The first utility scale solar/wind combination project in the U.S.—the 10.5 MW Kingman project—has started up in solar-rich Arizona, and there are already plans to potentially doublethe size of the project. The renewable energy industry has taken a page from conventional energy industry's playbook by aiming to capture more commercial value from a single location. Case in point: Western Wind Energy recently started producing power from its combined solar and wind power project in Kingman, Arizona. The 10.5 megawatt installation is the first utility scale renewable energy project in the United States that combines both wind and solar power production under one Power Purchase Agreement. Located on 808 acres owned by the company near Kingman, Arizona, and costing in the neighborhood of $28 million, the project involved Western Wind Energy signing a Power Purchase Agreement to provide energy to customers of Unisource Energy Services (UES), a subsidiary of Unisource Energy Corporation of Arizona. Through its utility subsidiaries, UES and Tucson Electric Power, Unisource Energy Corporation serves more than 630,000 customers across Arizona. Initiated by UES, the size of the project was dictated by the Arizona Corporation Commission's mandated renewable portfolio standard. Typically when a petroleum company identifies a commercially viable underground energy source, it will target the highest volume and most valuable commodities, which in most cases are oil, gas, or a combination of both. However, in the process of capturing the highest volume product, the company will extract or 'strip' other gases like propane, butane, and ethane from the production stream, which adds to its profit margin from that site. By combining solar and wind on a single site, Western Wind Energy is mimicking that same approach. 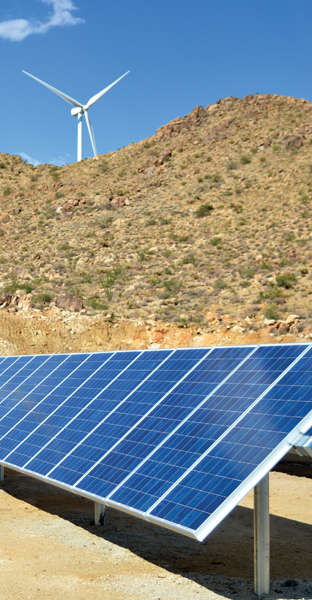 The combined wind and solar approach in Kingman was pursued by UES because it wanted to study the power generation profile of wind and solar on a single site and how it would fit into the utilities' power scheduling. UES wanted to see if wind and solar were compatible for the Kingman site and when there might be a curtailment of power generation from either source in relation to the other. "We were interested in seeing the integrated approach because it will give us some experience with the different performance characteristics of wind and solar energy," says UES spokesman, Joe Salkowski. "We're interested in seeing when the power will peak relative to our own system peak, and that will help us determine how to integrate these resources in the future as we develop additional systems. We're looking to see what the benefit might be of having those resources on the same site." Until now, the company's primary alternative energy investments have been in solar power because of its location in Arizona, with a small wind component. The solar component of the Kingman project is made up of solar panels capable of producing a total of 500 kilowatts of solar power. The solar equipment was installed by American Capital Energy and features 1,824 Suntech Reliathon 275-watt modules mounted on an Array Technologies single-axis tracking system. Salkowski says UES has, until this point, provided the renewable energy component of its power supply primarily from market purchases. The Power Purchase Agreement UES signed with Western Wind Energy is its first dedicated renewable energy resource. "We believe that it's worthwhile to dip our toes in the water through contracts that give us an opportunity to purchase renewable power generated from a variety of technologies, and in doing that, determining which of those technologies might be best suited for our business and our customers," says Salkowski. Site selection for this type of combined project depends on topography and traditional wind patterns. Mike Boyd, Western Wind Energy executive vice-president of development, says that some areas of the Western United States are particularly suitable for developing sites that integrate different power generation technologies. "There are some geographical areas where the wind blows at a totally different time than when the sun shines," says Boyd. Typically in the Western U.S., the sun shines during the day, and the wind picks up in the late afternoon.He adds that this scenario also raises the overall capacity of a single location where there are two different power generation sources producing at different times of the day. "So let's say, hypothetically, if a wind project has a 30 percent factor and a solar power installation on the same site has a 25 percent factor, and the output from both sources is the same, you could basically double the output of that site," says Boyd. He gave the example of the company's 120 megawatt Windstar wind energy project in Tehachapi, California, where solar power generation peaks from 10 a.m. until 4 p.m., whereas peak wind power generation occurs later, from about 4 p.m. to late at night. Given the experience that Western Wind Energy has gained by constructing the integrated site in Kingman, it is considering a similar integrated approach by adding a solar component to the Tehachapi project. "This is a situation where the power generation sources are compatible and there wouldn't be a lot of overlap," says Boyd. "This is a good situation, since you can maximize transmission capacity under those kinds of circumstances, and you would not have to employ some type of curtailment program on one or the other resource." He adds that sites demonstrating this wind and solar power generation profile would be potential winners if a power company were interested in pursuing an integrated approach. However, what may discourage utilities and developers from adopting this approach in the short term is how much more expensive it is at the present time to install solar power infrastructure compared to infrastructure for wind power generation. Also, while the Western United States seems a likely target for an integrated approach, Boyd says what they have discovered in reality is that optimum sites (where it is easy to tie in to the existing power grid) are not all that common. 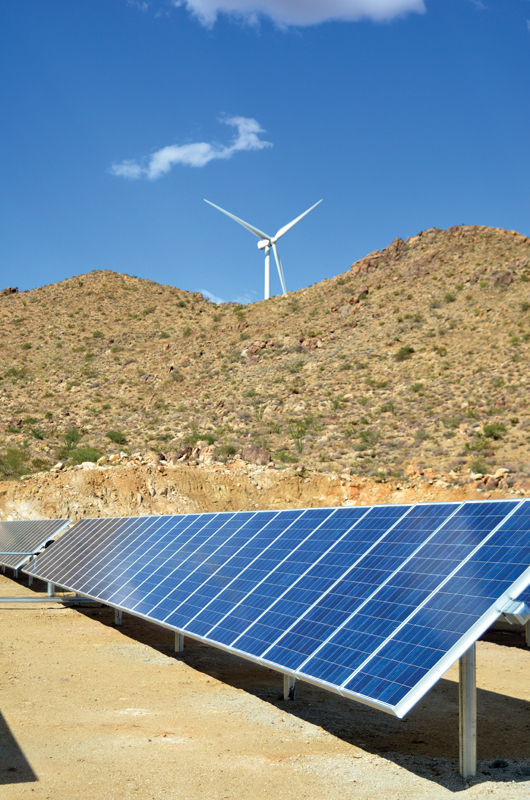 What made the Kingman site ideal was its combination solar and wind potential as well as an existing 69-kilovolt (kV) transmission line that runs within a mile of the project boundary. This existing infrastructure made it inexpensive and easy for the company to tie into the power grid. "We have done a little homework, and we have not found another site where there is this combination of wind and solar on the same property that can be fed into the same sub-station," says Boyd. "It's a good site for integrating wind and solar because it has a combination of very steep, tall ridges and reasonably flat land where you could incorporate the solar aspect. On the high ridges, we have the wind turbines and on the flats, we have the solar, and it has worked out well." The fact that Western Wind Energy purchased the property makes the project even more unique, as wind power projects go. As a smaller company, Boyd says purchase of the Kingman property versus some type of lease and royalty agreement with the previous property owner gave the company more credibility with UES, which was looking for bidders on its Request for Proposals (RFPs) on an integrated project. Outright purchase of the site took the potential issue of long-term property access out of the equation, and the price was so attractive that it was actually a better deal than to pay the previous landowner a royalty. What helped move the project forward on the financial end was the 30 percent funding support offered by the federal government as well as the accelerated depreciation benefit. State and local government representatives were also highly supportive of the project. "It was a pleasure to do business with Mohave County," says Boyd. "They were very eager to establish a renewable energy industry and consequently were receptive to how we proceeded on the project." The site consists of five 2-megawatt Gamesa wind turbines and solar panels capable of producing a total of 500 kilowatts (kW) of solar power. So the ratio is 20:1 wind to solar. Most of the project was constructed by Wisconsin-based, RMT Energy Construction and Engineering, a wholly-owned subsidiary of Alliant Energy Corporation. The solar equipment was installed by American Capital Energy and features 1,824 Suntech Reliathon 275-watt modules mounted on an Array Technologies single-axis-tracking system. Conversion of the solar AC power to DC was accomplished with the installation of a Solaron 500 kV inverter ahead of the 34.5 kV step up transformer manufactured by Cooper Power Systems. The wind and solar power are tied into the transformer separately. "What created a challenge is that the topography is very steep," says Boyd. "RMT needed to be clever and creative about engineering roads to get the heavy equipment up to the ridge tops." The solar panels are positioned on flatter ground far enough away so that there are no shading issues from the wind turbines. The turbines are visible to only a small percentage of the surrounding population as the project is about two miles from Kingman. Mohave County already had a general plan to establish the land as heavy industrial. All that was required was a modest zoning code change to allow for the wind turbines. Plans are already in place to potentially double the size of the project, but it would be strictly wind energy. "We are working feverishly to acquire a lease on an adjacent section of land with the State of Arizona, which has been a very, very willing partner in this project," says Boyd. "We think that there is a chance that we could get another 10 megawatts up and running on an adjacent piece with either Tucson Electric Power or Mohave Electric."